With the unceasing upsurge in the Mobile App Development sectors, it is arduous to foretell which trend is here to thrive forever. One such disruptive technology is Hybrid Apps-- essentially translated as the future of ‘mobile applications market’ and a current hot favorite of the developers around. The mobile app development market is rapidly swelling and there seems to be no end to the possibilities anytime soon. In the same wave of new mobile applications flooding each day, there is one latest trend that has amazingly attracted the marketers- Hybrid Mobile Apps. What Are Hybrid Mobile Apps? For those who do not know much about the sudden innovative blaze, here’s a quick insight. Hybrid apps are a collaboration of web and native apps and have attained a huge popularity lately. They serve as a perfect remedy for those looking for a quick deployment time and very high performance-- all at once. These applications are also designed to facilitate a better user experience, regardless of the device being used. Here are few of the astounding features of this framework that are potentially building the future of hybrid app development. These platforms offer seamless code reutilization features, whereby the code written for a particular channel can be used again. The developers do not need to write the code time and again and can utilize the saved time in enhancing and further improving the overall app experience. It offers an immersive and added benefits for those looking to augment an existing application without having to overhaul it. The only thing that they need to do is to inculcate the vital components of this framework into the original & real app code. The cross-platform support is offered by React Native that provides the much stipulated native views instead of web views. Therefore, situations become much more friendly for the mobile application developers as they need not contribute their precious efforts for program-specific coding. They can develop the applications without a hitch & can offer intuitive user-interfaces for both iOS and Android, and will soon cover other platforms as well. The frameworks availed for the Hybrid app development have made the process faster, smoother, and way more efficient. The reusable native components have a positive effect on the productivity as well as renders very high speed. They allow the developers to push updates to the users’ devices instead of going through the continuous update cycles on the app stores. What Are The Advantages Of A Hybrid App? It has a user-friendly interface and an amazing appearance. It is portable and essentially needs a native harness to run it. It reduces the cost of developing an app and the total time of development. There is absolutely no need to create two versions of an app: Android or iOS since it feeds on HTML. Instead of writing the native code in multiple languages, it can be written in a single code base. It can offer both offline and online access as the app can be packaged locally or through the servers. There is no wait for approvals or updates required. It has a huge range of platform-specific access such as the camera or GPS. They are compatible with multiple mobile platforms. 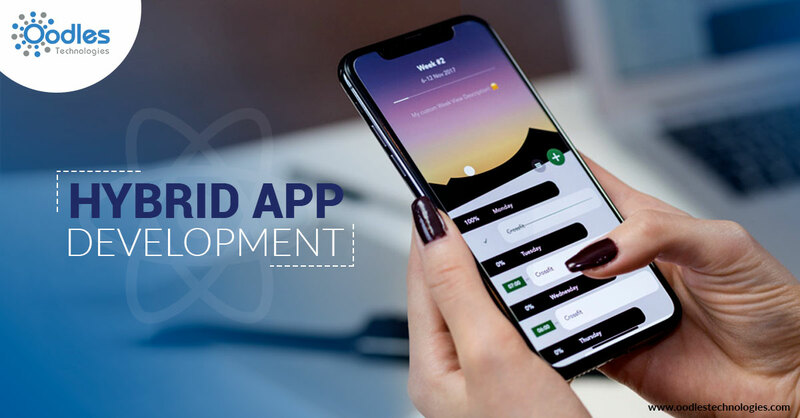 As the platform-preferences advance and higher performance systems are made live, hybrid app development will gain more pace and popularity among the mobile app developers and several companies. The future of hybrid app development is, therefore, more prominent and promising, and can benefit the developers on a very large scale. What are your thoughts on the future of hybrid app development? Write down in the comment section below. Also, if you are more interested in developing them for yourself, let us know. We will be happy to serve you.